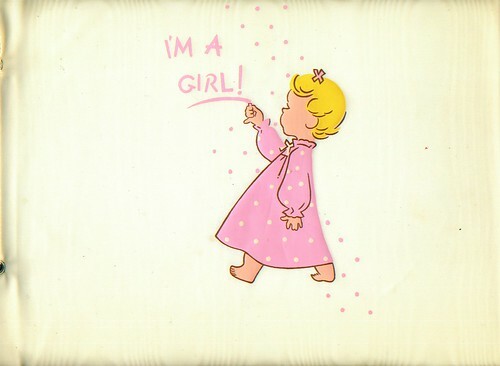 I’m a Girl, originally uploaded by Temeculamom. This is the front cover of the most darling vintage baby book I found recently (there are more photos of it in my flickr photos). I am selling it on eBay, and I got the nicest email yesterday. It seems the current high bidder had this original album, which her mother had completed for her when she was a baby. Two years ago, she lost her mother, and then a year ago, the album was destroyed in a flood of her basement. Being a scrapbooker, she had planned to do a layout (or several) about the album, but then she found the real thing on eBay. She was just emailing me to say thank you for listing it. That is one of my very favorite things about the internet-so many things are so quickly available to us nowadays. I have found books by my great aunt and uncle, magazine articles by my grandfather (who died when my dad was seven) and even a magazine featuring my grandmother on the cover. And now I am able to give this woman her baby book back. ~ by bekaboo on April 26, 2007. That’s really neat! It always feels good to make somebody’s day, doesn’t it? Hope you have a good one too! What a lovely story. Yes it’s great that the Internet can bring the ‘right’ people together so easily. What a great story. I love that she is able to use this album to tell her own stories. Cute album too. That is adorable! What a great find for that bidder. I loved looking through my baby album when I was little. Mine is unfortunately lost to me too though there is a slim chance I could see it again one day. They just don’t make them as neat as they used to!